The Paper Bag Princess - Elizabeth is a beautiful princess, until a dragon scorches her castle, burns her clothes and carries off Prince Ronald. Will she be able to outsmart the dragon and rescue Prince Ronald? This storysack contains a picture book to read aloud, a dragon puppet, paper bag princess and Prince Ronald costumes, a castle backdrop and an audio recording and fun activities to go along with the story. Five Little Monkeys - Five little monkeys put on their pyjamas, brush their teeth, climb into bed and fall fast asleep…or do they? This storysack contains a picture book to read aloud, 5 stuffed monkeys, a doctor set and props to act out the story, an audio recording and fun activities to go along with the story. On Mother's Lap - There’s lots of room on mother’s lap for all of his favourite toys, but Michael’s not sure there’s enough room for his new baby sister. This northern storysack contains a picture book to read aloud, props to act out the story, an audio recording and fun activities to go along with the story. Kumak's Fish - When Kumak takes his family ice fishing, everyone seems to be catching fish but him. Until he feels a huge tug on his line! This northern tale has a surprise ending. This storysack contains a picture book the read aloud, costumes for Kumak’s family and props to act out the story, an audio recording of the story, a non-fiction book about ice fishing and fun activities to go along with the story. A Barbecue for Charlotte - Charlotte the moose is different. She doesn’t like pretty bows and flowers like her sister Tiffany, but when she tries to hang around with the moose boys all she gets is teasing. How will she fit in? This storysack contains a picture book to read aloud, an audio recording of the story, stuffed animals and props to act out the story, a non-fiction book about moose and activities to go along with the story. The Mitten - Nicky’s grandmother knits him a pair of snowy white mittens, but he loses one in the snow. Will he ever be able to find it again? This storysack contains a picture book to read aloud, animal puppets and props to act out the story, an audio recording and fun activities to go along with the story. The Very Hungry Caterpillar - One day, a very tiny but very hungry caterpillar is born. He eats and eats and eats until something surprising happens. This storysack contains a picture book to read aloud, a caterpillar puppet that transforms into a butterfly, all of the food that the caterpillar eats, and audio recording of the story, a non-fiction book about caterpillars and activities to do along with the story. Walking In Dettah - You can see all kinds of animals walking throughout the whole year round. This storysack contains a picture book to read aloud, all the animals you see in this story book. Fun activities to go along with the story. 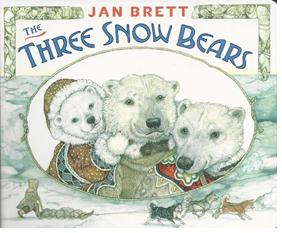 The Three Snow Bears - The Goldilocks story takes a fine twist when an endearing snow bear family and a curious Inuit girl meet. This storysack contains a picture book to read aloud, a doll, a stuffed papa bear, momma bear and baby bear, their blankets and bowls, an audio recording of the story, a non-fiction book about polar bears, and activities to do along with the story. 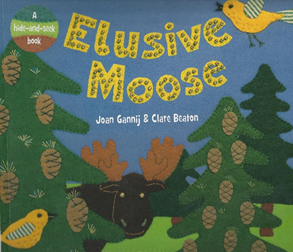 Elusive Moose - As you try to find the elusive moose you will meet all kinds of northland creatures and learn fascinating facts about them along the way. This storysack contains a picture book to read aloud, all the animals that you find in the story, an audio recording of the story, a non-fiction book about moose, and activities to do along with the story. 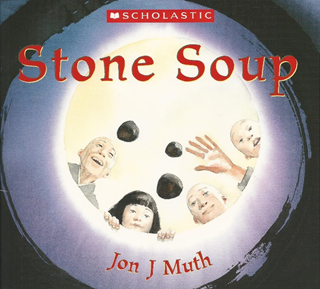 Stone Soup - This classic story tells us about three monks who visit a village where the residents are living isolated lives. The monks bring back a sense of living to the village through the making of stone soup.